The collapse happened at around 8:15 p.m. on Wednesday night. The building was empty and no injuries were reported, although people from 70 units in a neighboring hotel and condominium were evacuated. 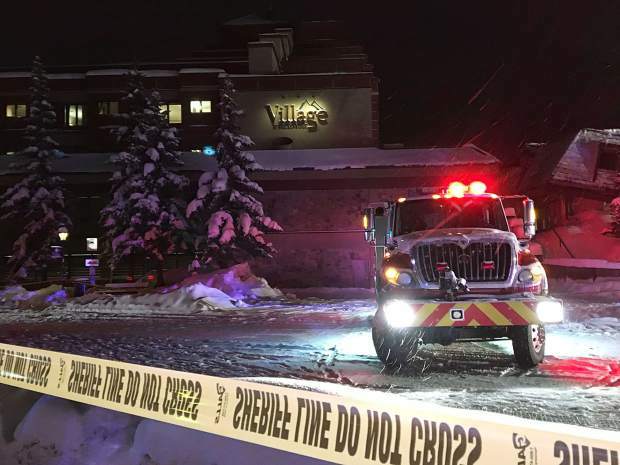 The roof of the Ten Mile Room in Breckenridge collapsed under the weight of historic snowfall on Wednesday night, prompting the evacuation of roughly 70 units in the adjacent Peak 9 Inn and Chateaux Condominiums. The large conference building was unoccupied at the time, and no injuries were reported. The Ten Mile Room was part of the Village at Breckenridge, a resort complex near F Lot. Buildings there were without gas throughout the day Thursday, as Xcel Energy had turned it off while crews worked to bring down a remaining wall that was hanging over gas risers. A Vail Resorts spokeswoman said in an email that the building regularly hosts groups year-round, although she couldn’t immediately confirm when the last event was, nor whether people had been inside during the day of the collapse. She said that staff were working to find alternative venues for groups that had already made plans to use the space. Officials said the collapse, easily the biggest in recent memory, was caused by a combination of nearly 49 inches of snow in a week and warm temperatures that made it wetter and heavier. Given its old age and large, flat roof that covered nearly 4,500 square feet, the Ten Mile Room was more vulnerable to collapse than its neighbors. County assessor records show it was built in 1972, when snow-loading standards weren’t as sophisticated as they are today, and many structures built then don’t meet modern snow-loading criteria. Thirty years ago, local structural engineers say, builders relied on uniform snow-load standards that didn’t take into account things like uneven accumulations and heat transfer from the roof. It’s unclear if that’s what happened to the Ten Mile Room. Flat roofs aren’t uncommon in Summit County and can be very strong under heavy snow loads, and building collapses are rare. A combination of historic snow and an old roof with a potentially dated design, however, may have spelled the end for the Ten Mile Room. The building has seen a fair amount of work in its time, but building permits dating back to its original construction don’t indicate than any structural work was ever done to its roof. It was a movie theater for years before being converted to a conference center capable of holding around 500 people in 1990. Vail Resorts acquired it in 1998 and around three years ago remodeled the interior. Although Vail Resorts resurfaced the Ten Mile Room’s roof in 2013, the work was not structural and only involved placing a new surface material on the top. Building permit records also show that there was asbestos mitigation done on the roof in 2015. Commercial buildings aren’t regularly inspected for structural integrity. Municipal and county official inspectors are typically only involved during construction — with some exceptions, like if there are complaints or a clear life threat. “We will permit and inspect, then when we turn it over we don’t get involved — but occasionally people will ask us to come over,” said Summit County chief building official Scott Hoffman, whose department does not have jurisdiction over Breckenridge or the Ten Mile Room. The town of Breckenridge’s policy on routine inspections could not be clarified in time for this article; however, officials in the other municipalities have said that, like the county, their inspection policies don’t extend beyond construction. Officials recommended that property owners with large, flat roofs bring in an engineer to check out their structure, know the signs to watch for and get snow removed if appropriate. The Vail Resorts spokeswoman said that the roof of the Ten Mile Room was subject to regular maintenance.